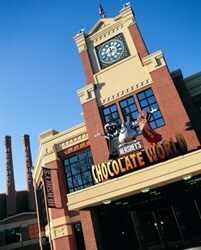 To view the full multimedia news release, please visit http://www.HersheyExperience.com. At age 40, Hershey’s® Chocolate World® Attraction shows no sign of slowing down. In fact, the world’s most visited brand experience recorded its best summer season in its history this year and the original location in Hershey, Pa., hosted more than two million visitors from all over the world. The experiential marketing leader continues its momentum as more stores are set to open around the world. More than 150 million guests have visited a Hershey’s Chocolate World Attraction since 1973, and the flagship location in Hershey, Pa., hosts more visitors than any other brand experience in the world. Summer is the peak season for Hershey’s Chocolate World Attraction and this summer set the attendance record and ensured the popular destination will record its best full-year attendance in its 40-year history. Summer attendance was eight percent above last summer, the previous season record. The Hershey Company has been recognized for its use of technology and innovation to develop new confectionery products to meet consumers’ needs. And Hershey’s Chocolate World has long been recognized as a leader for breaking ground with new, interactive and customizable multisensory consumer engagement experiences. From the moment guests walk through the doors, the scent of chocolate and freshly baked cookies greets them, along with Hershey branded characters and brand imagery on a scale unmatched anywhere else. From high-tech exhibits to unique ways to make the experience completely personalized, visitors to Hershey’s Chocolate World are completely immersed in their favorite candy brands and every sense is constantly pampered and teased with chocolate. Guests can customize their chocolate bars, taste different chocolate offerings and in Hershey, Pa., take a chocolate tour ride to learn how Hershey’s Milk Chocolate is made. These memorable, engaging and multisensory experiences increase consumer loyalty and result in lifetime retention. Part of the success of Hershey’s Chocolate World in creating a 360-degree brand experience is retail and merchandising designs that visually surround consumers in a complete brand experience, engage them with their favorite brands and provide access to the widest assortment of product available in one location. 2000: Visitors to Niagara Falls, Canada, plunge into a chocolate-lovers dreamscape with the opening of the first Hershey’s retail experience outside of Hershey, Pa.
To share the Hershey experience with more brand devotees around the world, The Hershey Company continues to invest globally and expand its retail footprint around the world by launching the next generation Hershey’s Chocolate World retail experience. The new retail experience, which captures the excitement and imagination of the original global flagship location, will be packaged and exportable to new markets to reach new and loyal consumers across the globe. Hershey’s Chocolate World retail footprint will expand in the next four to five months with the new stores opening in Las Vegas and China and plans for additional new locations worldwide over the next few years. Current Hershey’s Chocolate World locations include: Hershey, Pa., New York City, Chicago, Niagara Falls, Shanghai, Singapore and Dubai. Additional information and multimedia on this announcement is available at: http://www.HersheyExperience.com. The Hershey Company is the largest producer of quality chocolate in North America and a global leader in chocolate and sugar confectionery. Headquartered in Hershey, Pa., The Hershey Company has operations throughout the world and approximately 14,000 employees. With revenues of more than $ 6.6 billion, Hershey offers confectionery products under more than 80 brand names, including such iconic brands as Hershey's, Reese's, Hershey's Kisses, Hershey's Bliss, Hershey's Special Dark, Kit Kat, Twizzlers, Jolly Rancher and Ice Breakers. The company is focused on growing its presence in key international markets such as China, Mexico and Brazil while continuing to build its competitive advantage in the United States and Canada.